Try to warm up before stretching (heart rate about 60 - 70% of MHR). Stretch each muscle group 2 - 4 times for at least 10 seconds each time. Stretch after your match as part of a "warm down" as this will help recovery and promote increased flexibility in the medium to long term. Hold the stretch once you feel a slight burning sensation in the muscle being stretched. Alternate stretches on either side of the body. Never "bounce" on the stretch. Don't stretch injured muscles (unless advised by your Sports Injuries Specialist). Pregnant women should not fully stretch (see safety guidelines). Stand facing a wall one foot in front of the other. The rear foot should be about a metre away from the wall. 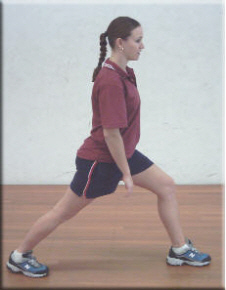 Bend and push the knee of the back foot forward and towards the ground. Hold for ten seconds - change legs. Stand facing a wall one foot in front of the other (as for achilles). Lean towards the wall placing both hands on the wall. Keep the heal of the back foot on the ground Keeping the knee straight, push the hips towards the wall, stretching the calf muscle. Hold for ten seconds. Change legs. Sit on the floor with one leg outstretched and one leg tucked to the side. With arms reaching toward the end of the outstretched leg, swivel at the hips to extend. The same stretch can be achieved in the standing position, elevating one leg onto a chair, table or rail. Reach forward to the toes of the outstretched leg. The stretch will always be more effective if the you bend from the hips rather than bending the upper part of the back. An effective lower back/hamstring stretch can be achieved by sitting on the floor, both legs outstretched at an angle of 20 -30 degrees and reaching for the toes of each foot in turn. Again, swivel at the hips for a most effective stretch. Standing, using a wall or chair for support, hold the foot of the bent leg, comfortably behind your body. Do not pull the foot up or out too much as this can result in injury. With the foot held firmly, push the hips forward until the stretch can be felt. If the stretch is not effective enough, pull the foot up a little more. Stand with your feet apart about a metre and in line. Use a chair or a wall to help balance if necessary. Move forward onto the front leg, bending that leg whilst keeping the back leg straight. Lower yourself onto the front leg until the stretch takes effect. Take weight off the stretch if necessary by placing a hand or hands on the front knee. 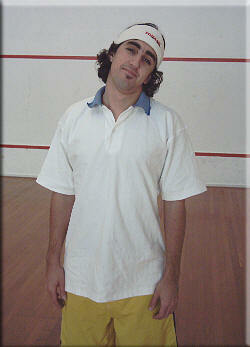 Squashgame Gold has more groin stretches. Lying down flat, take one leg at the knee and hold comfortably. Pull the knee to the chest until the stretch takes effect. To increase the effect of the stretch, pull the knee across the body towards the opposite shoulder. Adjust the dept and angle of the stretch to suit. 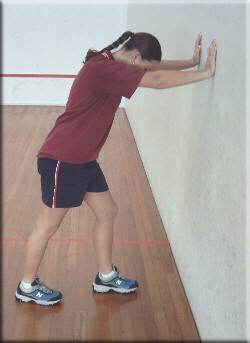 Squashgame gold has more gluteal stretches. Lie on your back on the floor, bending your knees so that the feet sit comfortably flat on the floor. Push your stomach down so that your lower back also touches the floor. Reverse clasp you hands and pass your arms over your head and towards the floor, keeping them straight if possible. If the arms do not reach the floor hold and repeat a number of times. Squashgame gold has more core stretches. Lying down on your back on the floor, take both legs at the knees and hold comfortably. Pull the knees to the chest until the stretch takes effect. To increase the effect of the stretch, bring the shoulders and head up off the floor and towards the knees. Squashgame Gold has more lower back stretches. 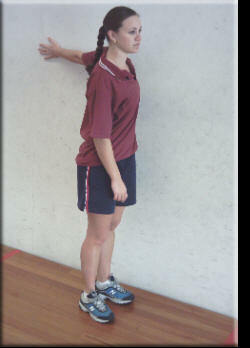 Standing with the feet about shoulder width apart, fold arms over the head. Lean to one side, ensuring that you do not twist or lean forward or back. To increase the effect of the stretch, pull the top arm at the elbow, over and across. Squashgame Gold has more side stretches. Stand beside a wall. 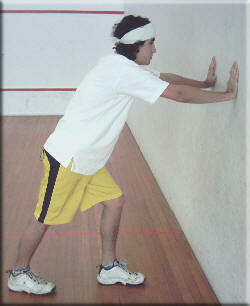 Keeping the arm approximately parallel to the floor, put the palm of your hand against the wall behind you. Adjust your feet to create the stretch. Back-hook one arm with the other just above the elbow. 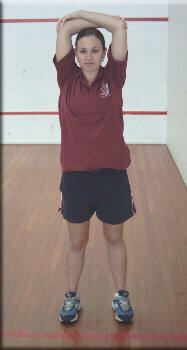 Squashgame Gold has more arm/shoulder stretches. In a standing position, lean your head to one side until you can feel the stretch. Do not twist or lean the neck to the front or back.